Alhaji Yakubu Gobir (Waziri Hausa) has urged the youths, especially All Progressives Congress (APC) supporters to desist from act of violence and abide by the law ahead as we approach general elections. Alhaji Gobir made this call on Sunday while speaking at campaign flag off of APC House of Representatives Candidate for Ilorin South/East Federal Constituency in Ilorin, Kwara state capital. He advised youths not to allow themselves to be used to forment trouble at their respective polling unit, during the elections. 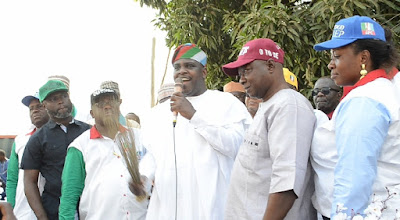 The former governorship aspirant expressed optimism that victory is assured for APC in Kwara state. Waziri Hausa urged APC supporters to mobilize electorates in the state to vote en masse for President Muhammadu Buhari in the coming presidential poll, as his victory will mean a lot for the party. Dignitaries at event include the Kwara State All Progressives Congress (APC) Chairman Hon. Bashir Omolaja Bolarinwa (BOB), Hon. Mashood Mustapha (MM), Amb. Fatai Yahaya Seriki Gambari, Alhaji Modibbo Kawu, APC Kwara Central Senatorial Candidate Dr. Yahaya Ibrahim Oloriegbe, Hon. Yinka Aluko (Esho) and many others.